The recession has driven a new approach to buying or renting coffee machines. Whether in Cape Town, Durban, Johannesburg or Pofadder…businesses and individuals are now more than ever, focused on value. Value, value, value – that interplay between quality, functionality and price. So lets look at why the Bianchi Sprint is rushing out of our warehouse. First, it is a quality coffee vending machine. 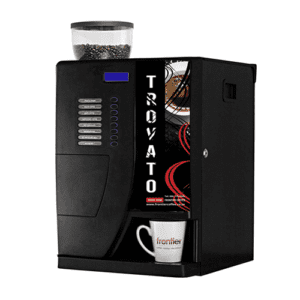 Italian designed and engineered, this coffee machine is now manufactured in China like most of the electronics in our homes and offices. So no surprises there. What may be surprising is that the manufacturer was selected as an official coffee machine supplier to the Beijing Olympic Games and has the highest European certification. So quality is great and the company is both stable and dedicated to customer satisfaction. Functionality. What do you really want from an office coffee vending machine? Don’t you want a range of great tasting beverages at the push of a button! Do you need 20 different beverages? Probably not. So if you can get espresso, black coffee, white coffee, cappuccino, hot chocolate, choccacino and hot water for tea or soup, wouldn’t that be enough? Add to that the ability to add sugar at the push of a button and you have the Bianchi Sprint! Does it have an anti-scale coating in its boiler? Nope…but then why pay a few thousand Rand more for this option when you are going to use a water filter anyway to remove the chemicals in our municipal water that negatively impact the taste of your coffee! Chlorine, for example, can really affect the way your coffee tastes, so we recommend a simple filter that not only removes these taints but also the minerals that can scale up your boiler. Does it have a fancy anti-microbial coating in its piping? Nope…but then why pay a few thousand Rand more for these fancy pipes that are rinsed with hot water during the cleaning cycle anyway? The hot water flushing cycle sterilizes the pipes and with or without the coating, you still have to clean the mixing bowls and the tubes that carry your coffee from these bowls to your cup. It’s simply just good hygiene anyway! Finally, price. That’s the great thing about these machines! They are not cheap by any means, but they are more reasonable than those assembled in countries with higher labour costs. Add to that the cheaper sea transport to Africa than from Europe or the USA, and you’ll find quite considerable savings! These are passed on to you the consumer – so you get good coffee at great prices! Oh, I almost forgot to add that the guarantee period and conditions are exactly the same as those for the European and USA models and brands. So we put just as much confidence in the quality of these Chinese assembled machines as we do in the other European brands we stock. We have not been disappointed and are willing to bet that you won’t be either!